Burlington Mayor Miro Weinberger said Tuesday he will need up to 20 days to decide whether to support a City Council resolution asking the Air Force for an alternative to the controversial basing of the F-35 jet fighter. Weinberger said he expects to use as much time as he needs before the council’s next meeting on April 16. Under the city charter, he must decide within that time frame. “I will use that time as needed to continue the further work on this issue that I promised, and to make this decision with care,” he said in a written statement. 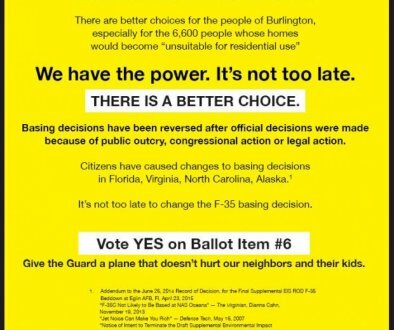 Weinberger has long been a supporter of the F-35 basing, but he told VTDigger in February that he would reconsider his stance if voters opposed it.